Here is a story that fulfils every stereotype about Filipinos you can think of. Many of them anyway. Here we have a second generation Filipino-American who grew up far from the culture of the Philippines. She is not even a Fil-Am. She is an American. That is where she was born and that is the land she knows. Her mother purposefully raised her in a way that she would have no "Filipino consciousness" because she recognised the superiority of Americans and American culture. They were heroes and liberators. As a result of this upbringing we see that Schofield is now a very successful woman. This lady was fully immersed and adrift in American society and culture. Her own colleagues did not even know she was Filipino. 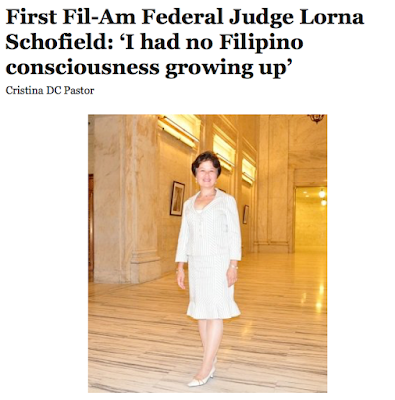 It took Obama and Schumer to reduce her to her Filipino heritage as "diversity was important to the process" of promoting her through the federal justice system. Is that really all they saw in her? A triple threat of: woman, minority, and qualified? She says she reached out to the Filipino community for support after she was nominated but after her mother died she had no contact with Filipinos and so she knew no Filipino organisations. However the Filipino community found out about her and reached out to her. The Asian American Bar Association of New York congratulated Schofield, a woman who says she never had much of an Asian identity, for being a great Asian American who epitomises the American Dream. In the last paragraph we read the most interesting piece of all. she pledged to try to give back to the Filipino community whenever asked, of course within the considerable ethical constraints placed on federal judges. What has happened here is the Filipino community has latched onto this woman like barnacles on a whale and are likely attempting to culturally blackmail and shame her into give theming legal assistance. And her response is she will give back so long as it is within the bounds of the ethical constrains on her position! If this lady had been born and raised in the Philippines, been baptised in Filipino culture, she would have tasted and eaten the corrupt fruits of Philippine politics and would be as corrupt and unethical as anyone else. It would be second nature to her because that is the legal and political culture in this country. What this story showcases and confirms is that it is Filipino culture which is the problem and not Filipinos themselves. With Filipino blood coursing through her veins this lady grew up unaware of and not indulging in that identity and not even caring about it. It also shows us the nasty side of identity politics and hyphenated Americans. Why should she try to help them simply because of her genetics? She is an American. She belongs to America. But the Asians and the Filipinos want to bask in her glory even though they had no part in her making. There is nothing for her to give back because she never took anything from the Filipino community or Philippine culture except for her genetics. 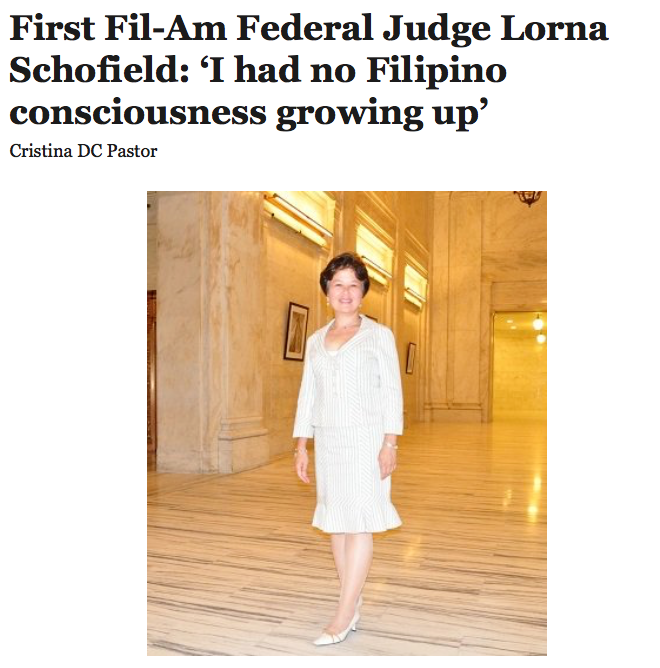 Yet the headline blares that she is a "Fil-Am" when she is no such thing at all. It's Fake news! Looks like a Philippinefails' direct copycat.